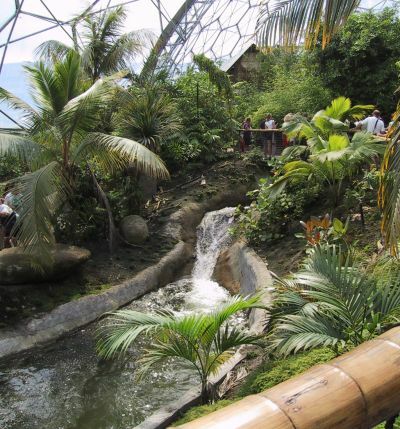 This page is about the visit made to the Eden Project, located near St. Austell in Cornwall, England. You can click here to see a page with more, different pictures about the project. After leaving the car parks, little can be seen of the vast undertaking nearby. The Visitors' Centre stands as the entrance. Inside and there are many sculptures (such as the one opposite) and artwork, drawing upon natural themes and materials. Indeed a notable feature of the whole endeavour is the accessibility of rich learning materials, promoting understanding of ecological themes. Past the Visitors' Centre, and the scale of the Project's work is revealed in its amazing glory. It is so vast as to almost seem unreal. After pausing a while to savour the view, exploration was in order! As luck would have it, as we wandered in the Temperate Biome, we happened upon a newly planted Joshua tree! However, try as we might, we didn't manage to find a Rowan tree (though there may very well be one somewhere!). The Tropical Biome was absolutely stunning. Rich and plush, with an artificially controlled environment, created via multiple water systems and steam jets littering the dome inside. From a relatively high vantage point, the scale of the landscaping below can be seen. Opposite you can see the Giant Water Lilies at the foot of a waterfall. In order to deliver a better impression of the various environments home to this array of plants, some example buildings have been put up. Some of them are decorative, but some are useful - serving as cool rest rooms. After all, it's a big area to walk round, and the Tropical Biome is deliberately kept at tropical temperatures! When we visited, the Eden Project had been open for less than three months, so many plants had yet to bed in properly, or grow very much. It will be very interesting to see it all in, say, 5-10 years, when plants will have had the opportunity to bed in and hopefully flourish! Great attention has clearly been paid to ensuring that the artificially engineered aspects of this environment will be complementary in years to come. With so much known (and yet to discover!) of the natural world, it is interesting to see and understand the origins of so much we take for granted. Opposite, Rowan and Joshua are looking at an exhibit about rubber! If you look carefully in the following picture you might see some baby fruit growing! and looks beautifully set to grow, mature and prosper well.